Broadcaster HBO gains rights to a program on Second Life, with one episode putting the spotlight on furries in the virtual world. Terrorist group Hamas uses a show strongly resembling The Lion King to encourage new extremists. In a world where dragonic overlords rule over the human race, one man sets out to destroy Bitterwood in the only way he knows how. By killing all the humans! 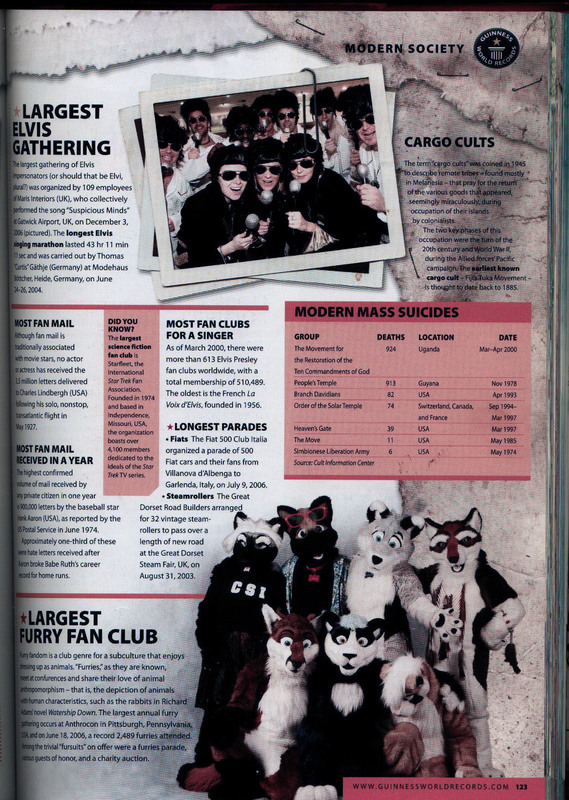 The 2008 edition of Guinness World Records calls Anthrocon the "largest furry fan club" in the world. A Pittsburgh paper interviews Anthrocon chairman "Uncle" Kage about what furries really are. The normally critical Register gives a fairly unbiased view of the furry fandom, concentrating on our contribution to Silicon Valley.